This book was published in 1939--before birth control. It is a first-person account by a young doctor who provided abortions to women. Our story continues as the parents of his intended bride find out that he performs abortions. ... "It isn't murder," I retorted angrily, forgetting that I had once very nearly shared her view. "It isn't murder any more than it was murder when you and your husband decided not to have any more. children after Rose was born." ....in my anger I'd hit the sorest point in the armor of the righteous. There are very few women who want their children, and there are fewer yet who want an unlimited number. I've met a few young wives who wanted children immediately, but most of them don't want to be tied down. They want to arrange their children. That's reasonable and natural. And the crusaders usually don't have many children. If they did, they wouldn't have time to run other people's business. A lot of them are equally indignant about the large, families among the poor. They're not so much against big families as they are against the parents having any fun. Read it at Bank Of Wisdom online library. 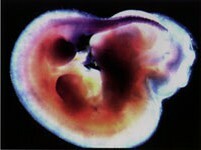 posted by Everywoman at 8:10 a.m.
Is an embryo a person?